The new Riley and Daisy Women's Riding Jeans from Alpinestars are aimed at the female rider who demands a seamless blend of protection and style. Riding jeans are the perfect pant to bridge the gap between looking like a stormtrooper and looking like a squid. 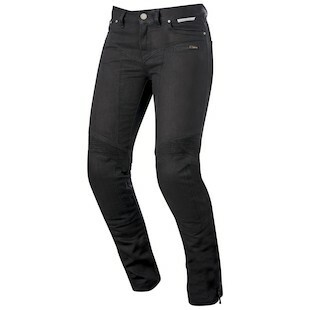 The Alpinestars Riley Women's Riding Jeans set their focus on the rider that needs a more technical pant. Features like the Interior aramidic fiber reinforcement panels in the seat and knee and denim accordion stretch panels help maintain abrasion resistance with a proper snug fit. Removable hip protectors and adjustable knee armor ensure ample impact protection. 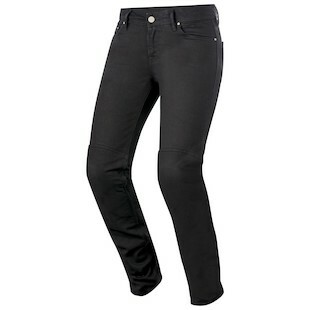 The Alpinestars Daisy Women's Riding Jeans are geared more for the rider looking to stay under the radar off the bike. The Daisy jeans drop the stretch panels and technical styling but retain a great deal of the protective features including the Aramidic fiber reinforcement panels and CE certified knee armor. The Daisy Jeans are a great choice for the commuter or around town rider. Both of these new offerings feature 13oz comfort denim and a zippered hem to fit easily over a pair of boots. Expect a classic European slim cut in both the Daisy and the Riley. Alpinestars has crafted jeans that will work on and off the bike and make sure you look good while you stay protected.